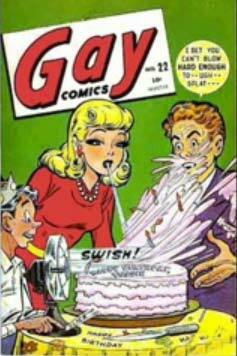 Random Panel: It's my birthday! 37 Responses to Random Panel: It's my birthday! Once again I say HAPPY BIRTHDAY! Here’s hoping you have a merrily gay birthday! I wish you a most Happy Birthday Jeff! Happy Birthday from Isia and me. Happy Day of Birth, Jeff! -There is a very famous ‘MAN’ who shares your birthday. -He debut in 1938 in an ‘ACTION’ pose, holding a car above his head. The Steve wishes you a Happy Birthday! May you have cake, and eat it too! @MartianBlue: Are you serious?! How can I be this big a Superman fan and not have realized that for forty years … ? Man, sometimes my own stupidity amazes even me. Thanks for the heads-up! And thanks for the birthday wishes. I’ve been holding on to this Random Panel for almost a year waiting to use it. p.s we don’t have to get you a present do we? happy b-day man. you are now over the Second hill. congrats. lol. Yes, that’s right, Boy Wonder! That arch-fiend, that diabolical mastermind of crime, The Bald Avenger is celebrating a birthday today. Gosh, Caped Crusader! Whatever shall we do? Well, I dunno about you, kid, but I’m gonna have another piece of cake. Why do you think they call ’em tights, anyway? Happy Birthday, Oh Lord and Creator! Happy Birthday Jeff! It only gets better from here!!! Happy Getting Into the World Day! Wishing for many years and many generations of HM to come! Happy Birthday Jeff. You deserve it. Happy Birthday! I just hit my twenty-third the other month. Feels good, man. Happy belated. You know what they say about getting older, right? Don’t forget to claim your no-prize.